The new Signia Styletto Connect Hearing aid is aimed at questioning what we believe a hearing aid should be. Transcending the image of old bulky hearing aid technology, the Styletto is a beautifully designed earpiece with the ability to connect wirelessly to your smartphone for hands-free calls. 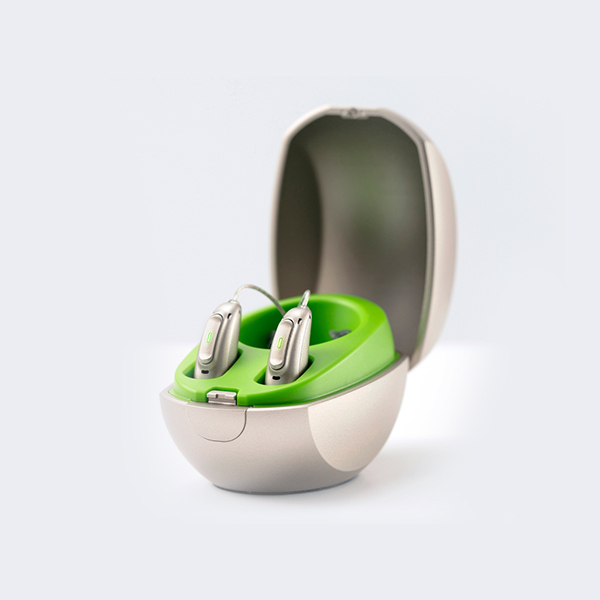 Still classed as the world’s first ever “SLIM-RIC” due to the devices uniquely shaped pin cell battery; a design element that has allowed the Styletto Connect to be the thinnest and arguably the most discrete receiver in the canal hearing aid on the global market. The Styletto Connect also boasts some of the longest rechargeable battery life available on the market with a single charge estimated to last as long as 19 hours. The unique on the go charging case is equally impressive with its wireless charging technology. Designed for busy and active people, the charging case provides the wearer with the ability to charge the device for short or long periods of time while on the go. Great for weekends away or if you are simply stuck for time and can’t reach a charging port which is common amongst other hearing aid brands. The Signia Styletto Connect is supported by the latest Signia NX technology which boasts Own Voice Processing (OVP™). OVP limits the wearer’s own voice whilst in the conversation for a more natural experience. Available in three technology levels the 3 Nx, 5 Nx and premium level the 7 Nx. The Styletto has the ability to be adjusted remotely by your clinician. That’s right you could be anywhere in the world and have the clinics support available to you should you need help. Only up until recently did this technology only reside in Signia devices, however arguably as pioneers in this area the technology supports the Signia Stylettos Connect design for support of those wearers on the go and living very active lifestyles. Unlike many devices in the market, the Styletto Connect has the ability to directly connect to your smartphone and stream phone calls into both ears, not just one. The Styletto Connect is “made for phones” due to its ability to connect directly to Apple devices without the need of an intermediate device for streaming connectivity. Perfect for people who spend a lot of time on the phone for business and or reaching out to family and friends. Do you want to stream the audeo of your TV directly into your ears in the comfort of your own home? Well with the Streamline TV accessory from Signia you can do just that to your new Signia Styletto Connect Hearing aids. This accessory is connects effortlessy and to all Signia Styletto Connect technology levels which include the 3Nx, 5Nx and 7Nx. The StreamLine Mic by Signia enables the wearer of the Signia Styletto Connect hearing devices the ability to stream android phone calls hands-free. Additional capabilities include the ability to stream music and other audio sources from any device with Bluetooth connectivity. The Signia Styletto Connect Nx Hearing Aid is adaptable, unique and easy to use. Take phone calls, listen to music and charge on the go!